Hello Everyone. I hope you're all enjoying this beautiful summer weather! I have some very exciting things to share with you today. We (at The Tin Thimble) finally announced the dates for this summer's Fashion Week and our 2nd Annual Fashion Show!! Yayyyy! There is nothing about this event I don't like. 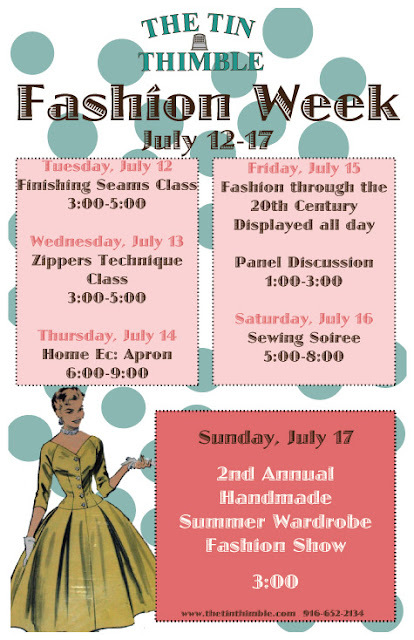 I love everything from designing the posters and handouts to organizing the fashion show. I can hardly wait for this week. 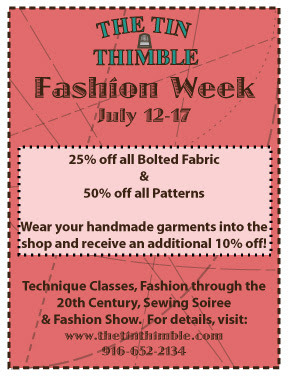 Please visit The Tin Thimble's website for more information on all the events, including prices, descriptions and more.